In just a few weeks, Christmas will be upon us… if your house is anything like ours, new toys will be scattered everywhere! Before your kids are showered in gifts from family, friends, and Old St. Nick, now is the perfect time to take inventory and donate any toys they’ve outgrown or lost interest in. I know it may seem easier to clean out their toys by just grabbing a garbage bag and ransacking their room while they’re at school, but as a Professional Home Organizer, I truly believe that it’s important to involve your kids in the donation process and teach them how to pass on and let go of items they no longer need. You see, every day I meet adults who struggle with feeling overly attached to their possessions… which then leads to a lifestyle of chaos and clutter. In our society, it seems that we are taught how to acquire more, but rarely are we ever taught how to let go. Furthermore, as a parent, you want to teach your children that the holidays are about more than just the number of presents under the tree. The holidays are about giving too, and a great way to teach your children that lesson is to help them donate some of their unused toys. Lead by example. Have them watch you go through some of your unused items. Explain to them that you just don’t need them anymore and that other people could really use them. Allow them to choose. If you ask them what toys they would be willing to pass on to other kids that need them, you may be surprised at what they come up with. Rather than selecting the toys for them, encourage them to make the decision for themselves. Turn it into a game. Give them a garbage bag and set a timer. See how many items they can grab in the short amount of time. Sometimes, if they don’t have to spend too much time thinking about it, it’s easier to let go. Make room for new toys. Before going through their old toys, have your kids sit down and take time to write their wish list for the holidays. After they see what new toys they will potentially receive, it may be easier to let go of the old. Decide on a charity together. There are lots of groups big and small that could use your donation, so make sure you help your child pick something that has meaning to them. Take them with you to the donation location. If your kids could actually go with you to donate the toys, it will make the charitable action a lot more of a reality. Toy donations for children of all age groups are needed especially during the holiday season. Some of the best toys to donate are dolls, stuffed animals, balls, games and puzzles, music toys, books, stickers and stationary, outdoor equipment, and interactive toys. Keep in mind that most used toys will only be accepted if they are in good used condition. And remember to double check that the games and puzzles have all of their parts so the next child who receives it won’t be disappointed. Check with each local business, organization, or charity before donating toys. 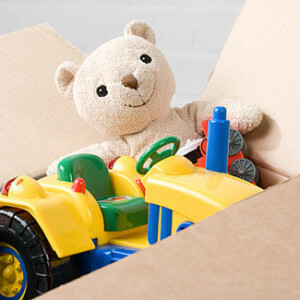 Many have policies on which toys can be donated. For example, most children’s hospitals won’t accept used toys for health purposes. Some items may also be more needed than others. For example, libraries may not need any more books, but they might be in need of children’s movies or CDs. Contact local organizations to assess their donation needs, wish lists and guidelines.